Those efforts won praise on Wednesday from Prime Minister Erna Solberg of Norway, who said in an interview that China’s plans for a carbon market would help its economy grow and protect people’s livelihoods at the same time. “We have to decouple energy use and CO2 emissions from economic growth,” she said. What happens in China has a crucial effect on global emissions. China produces more than a quarter of humanity’s emissions of global warming gases. Officials in Davos said they saw little indication that China’s influence in the climate change effort was ebbing. India, for example, is considering whether to follow the United States in putting tariffs on solar panel imports to help its own industry, or whether to bow to the dominance of China, by far the largest maker and buyer of solar panels. China also dominates the business of making wind turbines and is focused on becoming a force in electric cars. “We are trying to promote our manufacturers, but they also have to compete with international manufacturers,” said Ramesh Abhishek, India’s secretary of industrial policy and promotion. The stakes are high. Peter O’Neill, the prime minister of Papua New Guinea, contended at the conference that a severe drought in his country could be attributed in part to climate change. “The world seems to think they have time, but there are real communities already suffering,” he said. Falling Chinese emissions in 2015 and again in 2016 caused the entire world’s energy-related emissions to level off in those years. That gave some hope to climate scientists of progress in stabilizing humanity’s release of climate-changing gases into the atmosphere. China’s emissions of climate-changing gases from burning fossil fuels, already greater than the United States’s and Europe’s combined, resumed their climb last year as heavy industry expanded in the country. Yan Pengcheng, a spokesman for the agency, emphasized Monday at a news briefing in Beijing that China had expanded its use of clean energy. China’s generation of electricity by wind power climbed by about one-quarter last year, while solar power jumped by three-quarters, Mr. Yan said. But the increases in wind and solar power both came from low bases. Some scientists have been warning since autumn that China’s drop in carbon emissions in 2015 and 2016 might be reversed, and Monday’s data confirmed this. 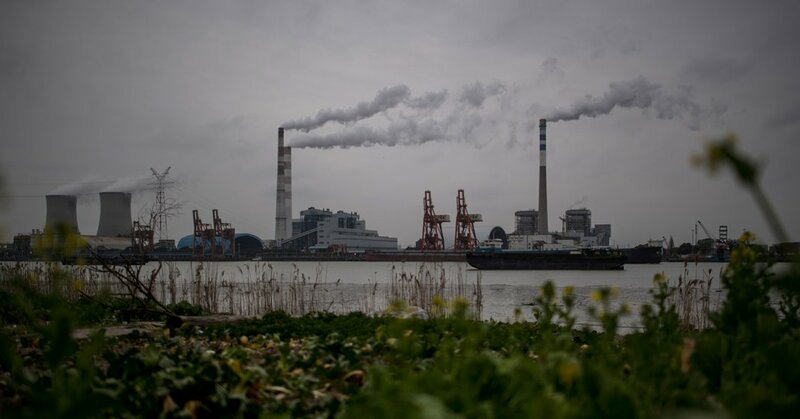 “The increase last year is a one-off — it’s not likely to be sustained — but Chinese emissions are not likely to go down either,” said Trevor Houser, a partner at the Rhodium Group, a New York consulting group specializing in China. Rhodium estimates that China’s energy-related carbon emissions climbed last year 2.2 percent to 4.1 percent. While China’s official figures for economic output show that growth did not falter in 2015 and 2016, and that there was a slight uptick last year, Western economists are skeptical of Chinese economic statistics. They say China’s government statisticians appear to have understated the extent of the earlier slowdown. Premier Li Keqiang himself has said before that electricity consumption statistics are more reliable in China, and something he watches more, than overall economic growth statistics. Mr. Stavins said that despite the uptick he remained optimistic about China’s ability to downshift its emissions trajectory permanently. China has also said it will make its economy much more efficient than it was in 2005 in terms of how much carbon it emits per unit of growth. Also by the 2030 target date, it plans to increase the share of non-fossil fuels as part of its primary energy consumption to about 20 percent. It is too soon for experts to declare definitively that all human-caused emissions of global warming gases increased last year, as most countries have not yet released enough data. Chinese officials have long pointed out that while their country’s emissions may be high, that is mainly because China has a lot of people. Emissions per person were only slightly higher in China in 2016 than in the European Union, and were lower than in the United States. Data from sources of human-caused greenhouse gases in China other than fossil fuels, such as from agriculture, won’t be available for several months, but those emissions are smaller. The backdrop for climate change worries here came in the form of snow drifts left by a blizzard that dumped more than six feet of snow in a week.